Rapture Of The Deeps | Watts Up With That? One of the reasons I lived so much of my life in the tropical South Pacific is because of the diving. 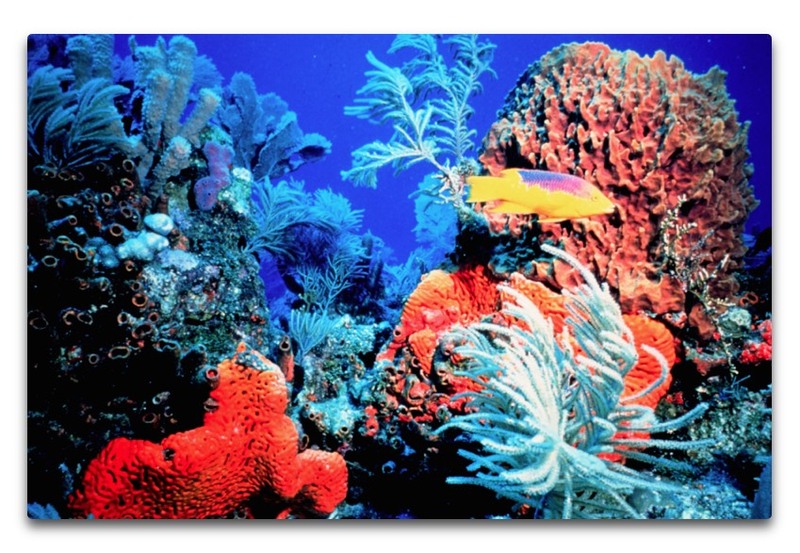 Coral reefs are one of the most astounding ecosystems on the planet, boiling over with energy, movement, and color. I’ve spent hundreds and hundreds of hours in the water, both snorkeling and scuba, and most of my time was spent just marveling at the endless variety of the reef creatures large and small. For the last five years or so (see the list of my previous posts in the end notes), I’ve been saying that the slight neutralization of the ocean from the ongoing increase in CO2 will make no difference to the coral reefs. In particular, I noted that the pH over coral reefs can change by a full pH point in the course of one tide. I also discussed the fact that coral reefs are often a source of CO2, and thus the reef itself drives down (neutralizes, wrongly known as “acidifies”) the pH of reef water. In my opinion, these facts made it very unlikely that a small neutralization of the ocean would make a significant difference to coral reefs. Since I’ve been pounding this drum for five years, I was happy today to see an article on Phys.org entitled Increase in acidity may not be harmful to coral reefs after all. It discusses a paywalled paper entitled Shifts in coral reef biogeochemistry and resulting acidification linked to offshore productivity. To better understand what might happen with coral reefs if more carbon dioxide makes its way into the oceans due to an increase of the gas in the atmosphere caused by human emissions, the researchers set up monitoring devices along a coral reef offshore from Bermuda—information from the sensors was monitored for five years (2007 to 2012). The team also had access to data from an ocean chemistry monitoring station approximately 80 kilometers from their study site. The combined data offered a unique perspective on coral activity. In studying the data, the researchers noticed that spikes of phytoplankton blooms occurred during 2010 and again in 2011—those blooms made their way to the coral reef offering more food than normal for the coral. The coral responded by growing which caused them to pull more alkaline carbonate from the surrounding water, making it more acidic. Eating more also resulted in the corals emitting more carbon dioxide into the water. The result was a big increase in acidity—to levels higher than have been predicted for the future due to human emissions—yet, the coral continued to flourish. These observations contrast sharply with the prevailing view that an increase in acidity is harmful to coral—leading to death if it goes too far. But the levels seen by the researchers with this new effort suggest that is not the case at all, and therefore muddles theories regarding the impact on the oceans of higher levels of carbon dioxide and warmer temperatures. Another team with Western Australia noted that the results found by this new team appeared to agree with those of a small study they conducted where they put boxes around some coral and piped in carbon dioxide, to no detrimental effect. My Usual Request: If you disagree with someone, please quote the exact words you disagree with. Only in this way can we all be clear on exactly what you are objecting to. I can defend my own words. I cannot defend someone else’s interpretation of my words. Further Reading: Below, in chronological order, are my previous posts on ocean neutralization. I visit Cairns (Australia) often. the older guys in Cairns and Port Douglas say that the coral comes and goes in beauty. Each “coming an going” seems to last about 5years for the past 60 YEARS. Another study that shows CO2 is oh boy, wait for it …. good for the planet! And can they not test this, with a real experiment? It is beyond the wit of human ingenuity to set up six coral tanks, all with different ph values, and see what happens? It is really that difficult to do a real experiment, instead of endless speculating? Or is the real problem that they know what the result will be, but prefer to spread scare stories instead? The intellectual lacuna at the heart of academia is vast and growing daily…. Controlled experiments trying to replicate the marine environment are notoriously difficult because of the complexity of the marine environment. Thank you Chaam. Interesting paper. 11/11. Time to remember our fallen men and women. Thanks Willis, excellent articles and links as always. I live in Cairns and daily get “acidification of oceans, massive bleaching next year, the reef is in need of more research (funding) it’s stuffed”. Agricultural run off is the only real problem. Corals grow bigger just north oh here in PNG where waters are considerably warmer! The MSM just repeat this nonsense without checking that most of it is based on failed models. Have you visited here Willis? That’s what I don’t get. You’d think that the activists would be happy that the problem is simple water pollution. There are clear people to blame, businesses to hang out to dry, and corrective actions that can be taken. Why they are trying to pin it on CO2 despite this being laughable is beyond me. Because it’s not about fixing anything. It’s about control and power. I have, went two weeks on the Nimrod live-aboard on it’s annual trip North to the Coral Sea. Falabulous! Wake. Eat. Dive. Eat. Dive. Eat. Dive. Eat. Dive. Eat. Dive. Sleep. Even been to Osprey Reef? BIG fish. 5 kinds of shark on 1 dive. Sea monster sized Morreys, Orcas and a curious Queensland Groper that came out of a cave as I swam by. Thing was as big as a beetle. The VW kind. Thought I was lunch there for awhile. That’s the best thing about diving Australia. The coral usually isn’t much but it’s about the only warm water country that hasn’t decimated its ocean life. That’s the real problem, not plant food. Yet another alarmist myth bites the dust! It bit the dust millions of years ago. I have better things to worry about than ocean acid. Today’s weather: Ocean PH to be highly variable. Will ocean acidification affect marine microbes? ……….Useful comparisons can be made with microbes in other aquatic environments that readily accommodate very large and rapid pH change. For example, in many freshwater lakes, pH changes that are orders of magnitude greater than those projected for the twenty second century oceans can occur over periods of hours. Marine and freshwater assemblages have always experienced variable pH conditions. Therefore, an appropriate null hypothesis may be, until evidence is obtained to the contrary, that major biogeochemical processes in the oceans other than calcification will not be fundamentally different under future higher CO2/lower pH conditions. ………. These observations reveal a continuum of month-long pH variability with standard deviations from 0.004 to 0.277 and ranges spanning 0.024 to 1.430 pH units. The nature of the observed variability was also highly site-dependent, with characteristic diel, semi-diurnal, and stochastic patterns of varying amplitudes. These biome-specific pH signatures disclose current levels of exposure to both high and low dissolved CO2, often demonstrating that resident organisms are already experiencing pH regimes that are not predicted until 2100……..
…..and (2) in some cases, seawater in these sites reaches extremes in pH, sometimes daily, that are often considered to only occur in open ocean systems well into the future . …..
…Changes in the watershed can, for example, lead to changes in alkalinity and CO2 fluxes that, together with metabolic processes and oceanic dynamics, yield high-magnitude decadal changes of up to 0.5 units in coastal pH. Metabolism results in strong diel to seasonal fluctuations in pH, with characteristic ranges of 0.3 pH units, with metabolically intense habitats exceeding this range on a daily basis. The intense variability and multiple, complex controls on pH implies that the concept of ocean acidification due to anthropogenic CO2 emissions cannot be transposed to coastal ecosystems directly…. Willis, plus many. I exposed the Fabricius Papau New Guinea hydrogen sulfide misconduct fabrication in essay Shell Games (ebook version, not the abridged CE post you also liked). Corrals will be fine if pollution and overfishing of essential reef species are curtailed. Nothing to do with CAGW. In addition to what has been presented heis re, a thought in the back of my mind every time I hear the term ‘acidification’ when applied to the sea. This thought is based upon the fact that the solubility of CO2 in a liquid (such as sea water) reduces when the liquid is heated. The old coke bottle trick on a hot day is an illustration of this. Take a coke bottle out of the fridge on a hot day and open it – hardly a fizz will be heard. Take the same bottle out of the fridge and let it stand in the hot Aussie sun for a few hours and then open it. The fizz will almost be explosive. It is the carbon dioxide in the coke that is doing the fizzing. Hot coca cola can hold less carbon dioxide than cold coke. The same applies to sea water. Now, back to the question of how this applies to ocean acidification. Surely, if the sea water is warming – as adherents of the CAGW hypothesis assert – then the trend will be for the water to absorb less CO2. So, what proposition do they want to argue? Are they arguing that the water is getting hotter – and therefore losing its ability to absorb CO2 or are they arguing that more CO2 is being absorbed and that the water must therefore be getting cooler? The hot one, Not the cold one. Mmm … you’ve got to be careful when you claim it has to be either A or B. It might be C or D.
Here’s the thing. As best as we can tell, the ocean is indeed becoming slightly more neutral. However, the ocean is not warming all that much. The relationship between temperature and CO2 is about 16 ppmv per degree. So the ocean hasn’t warmed anywhere near enough to offset the ~ 125 ppmv increase in CO2. As a result, there has been a slight neutralization of the surface waters. My claim has always been that the change is so trivial compared to the tidal, daily, monthly, or annual swings in pH that the ocean creatures won’t even notice. Thanks Willis, Yes, I can see that my position that it has to be A or B may be dependent on whether or not the sea water is actually saturated with CO2 at the moment or not. If it were saturated, then I would assume it would be an A or B proposition. Is that correct? If the ocean is not saturated with CO2 then the answer could be C or D. This raises the question of what is the current level of CO2 in the ocean in ppmv? Do you have any charts/graphs of what would be the saturation level at various water temperatures? How close is sea water to saturation? With relation to this issue I have been following the argument about the effect of limestone rocks etc as agents in the ocean which will buffer the so-called ‘acidification’ of sea water. Having stood on the limestone ocean cliffs of South Australia and Western Australia, and seen the enormous quantities of these buffering rocks, I am highly persuaded by this buffering argument. And, as an aside, I read Tim Flannery’s recent book ‘Atmosphere of hope’ and was appalled by his chapter titles ‘Ominously Acid Oceans’. (It is Chapter 3) In the whole chapter he uses the words ‘Acid’ and ‘acidification’ numerous times. He writes these words over and over again and talks in a way that the reader would conclude that the ocean is already acid in nature. In the whole chapter he never once mentions the fact that the ocean is actually alkaline. It’s terribly misleading. If you’d like to contact me via the email address on my website I’d like to discuss this in much more detail. I think it is really a clear case where the spin and misleading statements of people like Tim Flannery are just not true. Sooner or later the public has just got to eventually see through the misleading information that supposedly reputable people spin. I suppose El Nino’s of long duration and the following La Nina’s are not only changing the temperature strongly, but also will change the water chemistry in the same strong way by other winds, other currents and by other biological processes. And this all is devastating to the local corals??? Or are “corals”, like the earth, a not yet understood very complex and self regulating system which is not collapsing by slight differences in circumstances, adapting every time to these changing circumstances? And, Is the not understood “adapting of the systems” already in “the models”??? Both for corals and the earth? Here’s the thing. As best as we can tell, the ocean is indeed becoming slightly more neutral. Neutrality is a point in the scale. A neutral solution is when its pH is 7.0. A solution is either neutral (when its pH is 7.0) or not. It can be closer to neutrality but there is not such thing as a more neutral (pH = 7.0) solution. Like a beam balance, it is in equilibrium or it is not. That is my honest opinion. I don’t have an agenda and I don’t believe coral reefs are going to die just because there is more CO2 in the atmosphere. After all, they have survived larger swings that the one we are having right now. This paper just confirms it. Uederra, you’re splitting hairs over meaningless twerks of terminology. “Becoming More Neutral” is just as acceptable as “becoming more balanced” is on a scale. Yes, WE are splitting hairs. Not just me. That is exactly my point. Suppose you have an aqueous solution with a proton concentration of 1 nanomol. You add some acetic acid and the proton concentration rises to 10 nanomol. You have increased the proton concentration. Since the solution didn’t cross the neutral point (pH = 7.0) you cannot say that the solution is acid or neutral. All you can say is that you added some acid and the solution became less alkaline. But, sensu stricto, you cannot say that the solution is more neutral. Willis: you have provided a number (16ppm) due to warming of the oceans. I have been curious about ocean chemistry since I studied it in the 70’s. But I am neither a chemist or physicist so I’d like to know where the number came from. Ocean chemistry is complex. Most studies I find look like this whereas you have provided a specific number giving atmospheric concentration from warming. I assume this is not a straight calculation of CO2 solubility in water by temperature as my understanding is that the reaction in ocean water is different from what we would see in a controlled lab environment. Thanks for the post and illumination on this. Considering the natural diurnal and seasonal variations in the oceans (CO2, pH) with all the organic and inorganic chemistry, upwelling, down welling, varying temperatures, how does one calculate the net flux? I see many attempts, like the above but as a simple reader, I like the kind of number you used which is simple yo understand.. Many of the scientific papers are gibberish to me so presentations like you and Bob Tisdale make (along with a host of others) are invaluable. And the bi-yearly cycling of atmospheric CO2 ppm as defined by the Keeling Curve graph is a result of the seasonal warming and cooling of the ocean waters in the Southern Hemisphere. I think you Coke analogy would only work if the level of disolved CO2 in the sea water was any where close to saturation. In fact, it is a trace compound, and no where near saturation. Thank God that an author here is finally recognizing that “neutralization” is the correct term, and “acidification” is not. A basic solution that is becoming less basic is NOT being “acidified.” It is being neutralized. Any other description is false, and a deliberate attempt to deceive. It is being neutralized. Any other description is false, and a deliberate attempt to deceive. Thanks, MfK, but I fear that the second claim, of a “deliberate attempt to deceive”, is a step too far. People often use these terms simply because they’ve heard them used before. The term is very misleading … but that doesn’t necessarily mean there was intent to deceive. Think of all of the high school and college students having this nonsense drilled into them, with no encouragement to actually consider the terms they use. Willis, the people who use the term acidification in their press releases, research papers, & books, are accorded the status of x-spurts by the media & public, so it is incumbent on them to be accurate. Failure to accurately reflect the truth is inexcusable from people claiming expertise & deference to their opinions. I have to agree with Ray Boorman. If a media type uses the term, sure, that is likely just because that is what they have been hearing. But professors, scholarly magazines etc. know better. They are either intentionally deceiving, or intentionally not correcting, knowing that it is deceiving. Or, we can adopt the terminology used by the pool industry: they no longer talk about “acid” or “base”, but instead tell you to use “PH-Up” or “PH-Down”. Inelegant I will grant you, but there is no scare-value to be had from an article titled “Ocean PH-Downing Resulting from Increasing Atmospheric CO2”. I agree Ray. After all the pH scale is not rocket science. One doesn’t even need to have a HS level chemistry background to understand it. There is no excuse for using the term “acidification” for this context. Acidification is technically correct for any decrease in pH, MfK. Don’t throw out accusations unless you are completely sure that they are wrong in every sense. No Ben, it is not technically correct. As Willis stated “as the English language is commonly understood…” The use of ‘Acidification’ is intended to strike at the listener’s emotions. Jeff, to “acidify” means “to reduce the pH”. You can “acidify” sodium hydroxide from 1 molar (pH 14) to 0.1 molar (pH 13) with water, and you would be technically right to call it acidification (though it would be foolish, it would be correct). Similarly, if you ask everyone in America and 2 people say you should be declared King, you can say “There is support for me creating a Kingdom”. Just because terminology is deceptive doesn’t mean it’s wrong, so you should be extremely careful about calling someone a liar. But, what would George Carlin have called it ? Reducing the alkalinity of the water ? Neutralizing the resident alkalinity with an invasive acidity ? Pleasuring mother earth with a fine mist ? Violating her pristene nature with mankind’s foul emissions ? Forcing the burden of our existence on a helpless and beautiful planet ? Heh, well all I know is when I’m mucking around in their house, they are alert to the most sensitive of changes. When the water is clear and I have a good view, I can see an occasional pack. They are very curious, alert creatures. What amazes me the most is I’m sure they could take me down if I wallow out to far, but they don’t. It’s almost like they let me fish and occasionally let themselves be hooked, but that cant be. Perhaps they know I feel ten years younger playing in their pond. It’s all rather amusing as long as they don’t eat me. A basic solution that is becoming less basic is NOT being “acidified.” It is being neutralized. Anecdotal, as I am just a user who has to evaluate the safety of chemicals before we bring them into the plant, but somebody here in the process chemical biz might be able to cite industry standards for proper terminology. 1. CO2 does not harm coral reefs and in fact has been shown to promote growth. It is painfully obvious. Cold oceans=a lot less coral reef building going on. These thrive only during warm cycles. Every little bit counts….The phys.org article is not going to “alkalize” the headlong alarmist rush, however. I’m sure there are sock puppets galore girding for the smear. Especially in the next three weeks. Good stuff. Photosynthesis is a very alkalizing process and can raise the pH by over two pH units in a bay or estuary on a sunny day. Corals and all living things have physiology by which they control the chemical conditions, including pH, using metabolic energy. If this was not true, then a vinegary salad should kill a human who eats it. It’s blatant junk science for them to pretend that such a weak acid as carbonic acid can detectably affect the pH of the complex buffer system we call seawater. Furthermore, as there is a long, extended equilibrium from CO2 to carbonic acid to bicarbonate to carbonate to calcium carbonate (the latter is in a saturated condition in the tropics), adding more CO2 simply pushes this equilibrium toward producing more calcium carbonate. Coral reefs love this, there’s no downside. Only a source of protons from an outside source, such as a dumping of Hal into the sea, would significantly affect this equilibrium in a negative way, forcing it toward releasing CO2. Anything I add is just be parroting everybody else. Maybe parrot(fish)ing, in this case. No more arguing over neutralization or acidification, I have a solution . We chemists usually do, actually. If too much CO2 in the water is the problem, then all you have to do is de-carbonate. Simple. Here is an effective de-carbonation technique which would be applicable around economically valuable Tourist-Trap reefs, keeping the reefs healthy and profitable. All it takes is a bit of candy. This may be a bit of a take off on another fountain show, The Bellagio. So much for CO2 and coral. Thank you, Willis, for a very good article! Smashing….made me want to reach for my Fly rod! Yep, a 9 weight should do! Carbon dioxide is a natural part in corals as in calcium deposits, indicating huge levels of CO2 in the past. Thank you Willis for your treatise which is eye-opening, truthful and most scientific straight from the field and not from a computer model. One little detail: While agreeing totally about the ‘acidification’ thing being a misnomer, if not an outright hyped lie, in my opinion the addition of CO2 may cause less alkalinity and not neutralisation. What do you think? The oceans will always be alkaline especially considering that the pH scale is logarithmic. ….and the nail in the coffin is: poor or total lack of understanding of chemistry! What about mentioning the fact that the oceans have a slight negative charge. Until the oceans become positively charged they are not acidic. Re: neutral view of ocean pH on 1-2-2015…After reading your January post I obtained the worldwide pH data from NOAA containing the 2.5 million pH measurements taken. Since the data were from all depths, I selected the 0-10 meter depth group and plotted all of the remaining and more than 492,000 measurements dating from 1921 to late 2014 using Excel (which was barely capable to do this) and found the pH values to be rising to present day, to my surprise, with a slope of 0.0047. I would show the chart here but cant figure how to post. I thought perhaps this cannot be correct, so I then calculated and plotted annual averages (had to cull many outliers of pH =0 and pH =12-14 to do this). The result showed an upward slope but with a down-and-then upward shorter trend from 1980 to present, perhaps with this hiccup corresponding with intro. of digital thermometers. Anyway the upward slope was not so pronounced as the first attempt yet it still remained ever so slightly positive. This is pretty solid evidence collected by NOAA that sea water is not becoming less alkaline or even approaching neutral. Better indict Excel along with Exxon, just to be on the safe side. The result was a big increase in acidity—to levels higher than have been predicted for the future due to human emissions—yet, the coral continued to flourish. This sort of loose language would have been met with a FAIL in my days. Biomineralization by coral polyps is a complex, energy-driven, biochemical process which is completely different from the precipitation of CaCO3 (Ca(2+) + CO3(2-) CaCO3 from a supersaturated solution. Ultimately it comes down to the reaction: HCO3(-) + Ca(2+) CaCO3 + H+. The H+ ions formed in this reaction are actively pumped away from the mineralization zone, which drives equilibrium of the reaction to the right. When the pH decreases the concentration of HCO3- will increase, so theoretically this would favour CaCO3 formation, all other things being equal. you need to dive at bikini atoll, the coral is growing like a forest and in pristine condition- take a geiger counter just in case. Back in the 50s islands and coral were vaporized by nuclear bombs, the seas boiled at 55,000 degrees. Some come back for the coral!! Claiming the oceans are “acidifying” because of a slight drop in ph alkalinity is a bit like saying water is “freezing” if it happens to cool from 10 to 9 deg C.
Let’s be realistic: reefs thrive during WARM CYCLES and suffer during Cold Cycles. Otherwise, reef growth would be enormous during the much longer Ice Ages and that certainly is not the case. Whilst I am often told that my house in Somerset is below sea level. It is quite certainly not. However, with access to youtube, my partner and I are able to frequently experience life below the waves. Apparently life on the bottom of the sea is totally nuts. So we have learned. Here’s our favourite eco-system – the Lembeh Strait. So called muck diving. Trying to grasp how such creatures evolved purely on the basis of marginal advantage is a test of the intellect. If God exists then he sure has a great sense of humour!! Even better – take some mescaline and then have a look!!! Well, it appears clear that the corals have not read any of the published “Ocean Acidification studies” or they would have done whatever was necessary to avoid actually being studied. Perhaps the corals are on the payroll of “Big Oil”? Are the oceans not already more-or-less saturated in carbon dioxide? If so, as the oceans warm, carbon dioxide will exsolve from the oceans due to the increase in water temperature, correct? Are not the oceans contributing to atmospheric carbon dioxide even now? Studying for my chemistry degree titrating a solution to determine its pH and total ionic strength was basic lab work. The accurate term is neutralizing, but when adding an acid it was often called acidifying even by full professors. So using acidifying colloquially in a chem lab is fine. Using acidifying when talking about the environment and seawater this way is an alarmist term bringing up images of dissolving something in concentrated acid. The water chemistry is much more complicated than CO2 “acidifying” the ocean. The ocean contains roughly 3.5% weight/volume of dissolved solids. Most samples also contain significant amounts of bacteria and plankton. Measuring pH accurately to less than .1 unit is affected by the contaminants and requires careful work to be reproducible. The other anions(in addition to choride) have resulted in different pH scales because the amount of “free” H+ can be different than the total amount of H+. Nothing in nature is easy to measure! NAUI 270872, 7/1973. Over the many years, I’ve seen neither sea level rise nor sea habitat destruction among our many dives, spread from The Nubble, Maine, to well off of Tioman Island, South China Sea. Well then you need to put on the special alarm goggles, that alarmist environmentalists wear. And then go searching for confirmation of the presumed catastrophe. It must be somewhere – dammit!!! Look and look. And if you can’t find it then look harder. And if you still can’t find it then make something up. yep, and in all my dives, the only reef damage I have seen is from fool tourists walking on them or trying to excessively handle them while diving. The other damage I saw was from a nasty village fishing practice of throwing explosives into the water – those reefs were a mess! Rapture of the Deep – CO2 poisoning? Actually, as you likely know, Jinghis, “rapture of the deep” is a real phenomenon. It refers to the feeling of intoxication you get on deep dives, and it is a form of mild nitrogen poisoning. I seem to recall a similar condition can arise when the partial pressure of O2 is too high, limiting scuba diving even with a heliox set up. I must quibble with your interpretation of the English language. Acidifies (or alkanalizes) are statements of vector. It’s like saying a number is increasing or decreasing. It doesn’t matter whether the increase is from 3 to 4 or from -2 to -1. Both are increases. Neutalizing on the other hand is a statement of absolute value. It means that the value, whether initially positive or negative, is now closer to zero. In this particular case with CO2 and seawater, “more acidic”, “less basic” and “more neutral” have the same meaning. But if the changes were from pH 8 to 5, that would also be “more acidic” and “less basic” but NOT “more neutral”. “More acidic” and “less basic” are always synonyms. “More neutral” is not. My comment is not meant to distract from your larger point that the choice of “more acidic” is being deliberately chosen for its inflammatory value. Just that your criticism of that choice as contrary to accepted usage of the English language is a step too far. Apologies. Typo above. Should be “alkalinizes”. I agree Mike. I was quite familiar with using more acidic in the same sense as less alkaline, back before all this began. If I tip vinegar into a solution of caustic soda, then I am acidifying it in my view a.k.a. making it more acidic. Whether the resultant solution is still alkaline, or not. I think that people are far too pedantic about this. It doesn’t serve skepticism to resort to pedantry. Especially not when the pedantry is groundless. Indefatigable, as I said above, in our normal english usage something cannot be both more acidic and more neutral at the same time. • Increasing CO2 makes the ocean more acidic. The use of “acidic” is a misrepresentation of the reality. The ocean is not getting more acidic. It is getting more neutral, and in our normal use of english, it can’t be doing both. And it also plays on the emotions of the reader. Most scientists (including yourself, apparently) are unaware of the hugely negative emotional overtones of the second statement. Willis, sadly I am aware of the negative overtones associated with “more acidic” in popular conciousness. And strictly I should say that “I neutralized my caustic soda solution using vinegar.” – assuming that I had stopped tipping before catastrophic acidity occurred. I do agree with your principle point, that “acidification”, “more acidic” and certainly “more acid” are misleading in the ocean context. Intentionally so, we can probably assume. My concern is that this discussion may well be perceived as equivalent to two philosophers arguing over whether night-time is defined by the presence of darkness or the absence of light. Hopefully along the way, some people will discover that the ocean is surprisingly alkaline and highly buffered. And maybe some will perceive that the most alarming reports of reduction in alkalinity were local, over-blown or purely speculative. Your brilliant contribution can only help in this regard. A few realities from my POV. 1. The public suspects something is amiss. Normally, the public follows what science says likes bees to honey. They are resisting. Warmists pawn this off as “it’s a threat too far in the future”. I don’t think so. The public is beginning to wonder how much is this going to cost them this time. 2. While a worldwide carbon tax would have been nice for the warmists, that’s not what they were really shooting for and they wont get it this time in Paris. They may be able to gangster style get slush fund contributions tot he cause but that’s about it. They want to institutionalize the ability to buy voters in the US. The US is the cherry on the global pie. That’s what they are after. If they can pull that off, they can cement another political cycle. Time to drag the rest of the world along will be in their favor. The primary disadvantage for the US skeptic is that America has been sculpted thru law and policy into protected classes. Those protected classes are loyal to the Democrats. The unprotected classes are shrinking in number and the voting base for the Republicans is a well. The strike to heart of the matter is the awakening of the silent majority. The word needs to get out about how much this is going to cost them, their children and the communities they live in. Warmists know this is the soft underbelly of their strategy and so they bury the costs in hard to track and feel expenses to the silent majority. Unraveling that cost in black and white terms is crucial to the messaging. Truly Knute. I see all that you describe. The problem with that slush fund is that whilst much of it will be embezzled in some pseudo-legitimate manner. A large swathe of it will bring in new people, create new incentives and fund more confirmation bias driven cargo-cult science and more “promotional” efforts. That’s always the problem. Half the money can be spent on creating phoney incentives and on brainwashing. I’m in the UK, of course. I’m pretty sure that we are in a worse situation than the US. Living here as a skeptic is like existing as one of the last remaining humans in invasion of the body-snatchers. I meet good, kind and reasonable people who have simply never heard ANY of the skeptical arguments. Having a “state broadcaster” turned out to be a disaster. The problem is that even just a few tens of billions in the hands of thieves can fund a great deal more thievery!! I’m not looking forward to Paris. I suspect that the EU will kick itself squarely in the nuts even if Russia and China only play along with pretend commitments and trickery. Meanwhile the marketing machine will tell everyone here in the UK that Russia and China have made equivalent commitments. And so we should all officially rejoice at the great victory. Putin will likely enjoy pretending whilst the EU progresses further down the road to energy insecurity and Gazprom dependence. We also give shelter to growing protected classes in the UK. So vast in number that even our political right must pander to their every whim. This happens when climatologists don’t supervise other scientists. Chaos, total chaos! Willis: you have provided a number (16ppm [increase in CO2 per degree of warming]) due to warming of the oceans. I have been curious about ocean chemistry since I studied it in the 70’s. But I am neither a chemist or physicist so I’d like to know where the number came from. Ocean chemistry is complex. I used the CO2 values and the temperature values from the Vostok ice core data, and regressed one against the other. I made the usual assumption that the global temperature change was about half the change at the poles. Implying that other causes of emissions would not make any difference. In 1998 I spent a few days snorkling and diving at Perhentian Islands in Malaysia. I loved it. Some years later – I was panicked by the propaganda of United Nations. I thought: Ooh my good – my two kids really need to see corals before it is too late. But then I was exposed to some very incompetent enforcements by the government, based on the global warming theory. I thought – Hmmm – I really need to look into this – and I did – that brought me to various climate blogs. It made me start looking into the IPCC assessment reports – and here I am – more and more aware of the idiocracy by United Nations. I´m not concerned any more – my two kids will see corals – my third kid too – and eventually my grandchilds. However I´m not sure my grandchilds will see United Nations – at least not in it´s current bloated form – I hope not. Even if there is some effect by CO2 – it is nowhere near hell – war is hell. I hope you don’t mind me asking a couple of questions about yourself. Your conversion struck me as honest and forthright. A matter of factness to it all. When “An Inconvenient Truth” came out were you a skeptic by then ? If not, were you energized by the call to action ? Did you feel part of a movement ? I’m asking because I’m trying to gauge the rate at which public consciousness is changing. Yes, I know this isn’t a statistically significant poll, but I’m following my instinct here. It is hard to remember though. I wanted to give it a try, but is seems like it just ended up in an opinion piece. However. However – In the mid nineties I marched in a protest against a gas fired power plant. I was influenced by slogans from the green Non Governmental Organizations. It didn´t occur to me that United Nations could possibly mislead. I thought all students in the world were taught about logic and scientific methods, I thought most people try their best to be honest – and I still do- but truth is not readily available to us – that is why logic and the scientific method is so important. I did not see the film “An inconvenient Truth”. I think I generally try to avoid exposing myself to propaganda – since high school I have been aware of the risk of propaganda – but I am by no means immune to propaganda. What really made me realize that something was wrong was the misconduct demonstrated in the leaked e-mails (2009). The skeptical sites has been very important to me, but some sites which really made me see that something is wrong was the sites of the proponents for global warming. Sites like skepticalscience and realclimate. Not to forget the best source of all – the assessment reports by United Nations – Intergovernmental Panel on Climate Change. In particular the contribution from working group I. One of the places that scientists failed is as a profession is that by and large they didn’t want to bother themselves with risk communication or weren’t good at it … or worst, sold out for the attention and money. It’s tough translating scientific uncertainty to the peoples. I think they are learning though that they have to be better at it, otherwise they will leave themselves open to being abused again. I would also suggest that the reason you hear so much alarmism about coral reefs is partly because they are underwater to begin with, so any statements about them are difficult to measure and check. Alarmist opportunists migrate to such domains because they can say virtually anything, without anyone knowing whether it is even remotely true or not. 1. 9%, 11%, 19% and 50% of the coral reefs have already gone. Take your pick. (Mine is 0%). 2. Sea level rise hurts the reefs because they cant grow fast enough, stationary sea levels hurts them because they are unable to adjust to a slowdown in sea level change, and falling sea levels hurt them because they will be exposed. So any sea level, stationary, rising or falling, is bad for them. Life is fascinating. It seems to always do more than we think it can. …sunscreen. Discovered by Japanese scientists a number of years ago.